The Power of Narratives: Can One Story Survive? This week, I received an invitation to join Cowbird, a fantastic site that defines itself as “a simple tool for telling stories, and a public library of human experience.” On a more basic level one can see it as an “audio-visual diary” of your life, but the site goal is more to catalogue experiential knowledge through a multimodal narrative format that overarches the “sagas” of its users. 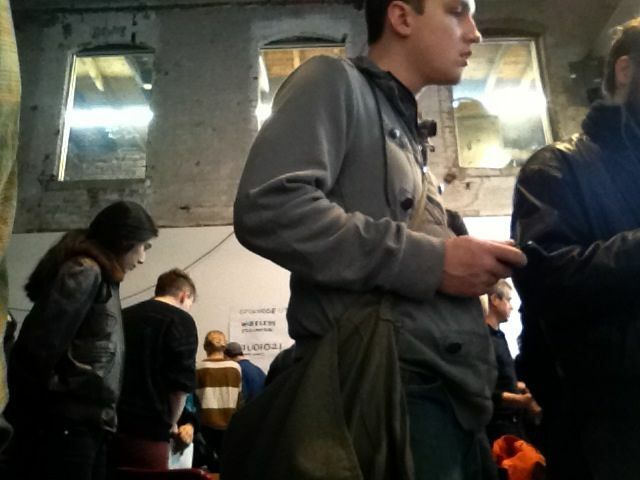 Me, photographed by some installation at the Activist Demo Day at Eyebeam last spring. The first time I remember hearing about Cowbird was during an Occupy-related event at Eyebeam – I was telling a colleague of mine about my interest in these ideological, mythological forms of information embedded in media, what Barthes would have explained as the “third order signification.” This reminded him of Storify, and Cowbird. Storify was popular at the time because of the way that citizen journalists had used it to help craft the narrative of OccupyWallStreet, but I hadn’t heard of Cowbird. Over the past year I checked into the site occasionally, reading stories and enjoying some of the things that had been shared. I’ve always enjoyed reading the stories of others. Over the past ten years there have been fantastic sites dedicated to cataloging the experience and narratives of people, in ways that shattered the illusion of an everyman/everywoman. There was The Lowbrow Project (and it’s 2.0 version) – a thing largely lost to the internet, so I’m convinced I’m one of the few people who remember. Lowbrow took anonymous stories and let the world read about the things others had been through. The second version was to incorporate a phone line where people could call in, leave a message, and then listen to it later when they were assembled into a podcast. There are other anonymous confessionals – GroupHug and PostSecret having spawned books and being two of the more famous. But there was also RandomAccessMemory.org, which was a “an experiment in collective recollection.” And if one knows where to look, you can find great stories still being shared and thriving – Pathetic Geek Stories used to be a favorite of mine, Overheard in New York was birthed from the now-defunct InPassing, and everyone loves FML, just to name a few. Even B3TA’s Question of the Week goes back to 2003 and has thousands of answers. The format of social media may be to create a digital footprint of the stories we are creating right now, but to actually trace and draw out the journey is something that is done through different frame of mind. Andrew Burstien and Nancy Isenberg recently pointed out how journalists make poor historians. Writing history (as opposed to events) is a different mode. But we are keenly aware of how the metanarrative, the grand story, is a seductive and powerful voice. Its uses range from branding national myths and symbols (BNMS), propaganda, creating rhetoric for bigoted world views. We’re quite used to hearing about a huge story that explains everything, whether its a political myth based in religion, or religious myth based in politics. How we define such phenomenon is troublesome because it also reveals our own ideological orientation and discursive preferences. One could say how anti-interracial marriage practices in apartheid South Africa and modern Israel have their roots, not in Afrikaner Calvinism or Jewish Orthodoxy, but the simple political implications for mixed-race offspring. The universality of these metanarratives is shattered when we make the effort to pay attention to the experiences of others. New media has many potentials and dangers, as Matthew Hindman and Evgeny Morozov point out. For the organization, storytelling is the most powerful social unifier, the moral mission exemplified by Jesus. Moreover, it is the only way to get people to do anything, individually or collectively, to positively change the world. It is precisely by reaching the “hearts and minds” of the uninitiated through storytelling that Russell argues one can avoid polarizing audiences. “Kony 2012” thus imagines itself as the spark igniting a new, universal revolution to end human suffering. If you haven’t seen the TED talk by Chimamanda Adichie I posted above, please watch it. It’s well worth the time. It further drives home the point Rawlins and Kish make about how totalizing ideology, even in the name of social justice, can serve to create the polarizations and conflicts we see fade away when we account for a multiplicity of perspectives. Even on the internet, where millions of stories are available, many of us still believe in the one story, something totalizing and inflexible. We lend our experiences to it, advocating it, even as we are unaware how our own outlook and experience flavors it a bit differently. We wash over those flaws because we believe in the power of unity. But as more micronarratives, counterpublics and alternative perspectives come closer within our own circles and networks, can the one story survive? Moreover, should it survive? Morozov, Evgeny. The Net Delusion: the Dark Side of Internet Freedom. New York: PublicAffairs, 2011. Hindman, Matthew Scott. The Myth of Digital Democracy. Princeton, NJ: Princeton University Press, 2009. This entry was posted in Media Studies general, Social Change and tagged cowbird, digital democracy, media studies, metanarrative, narratives, narratology, new media. Bookmark the permalink.